in garter stitch after blocking. 68 inches (172.7cm) across the wingspan, 30 inches (76.2 cm) from neck to bottom point. A simple and easy-to-work knitted garter stitch body shines when edged with an intricate crocheted lace edging. 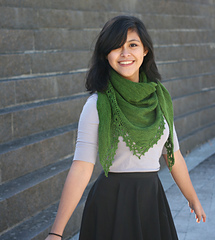 Work it in a single yarn, or work the edging in a contrasting color. 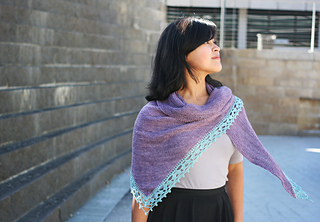 This shawl shines no matter what fiber you make it in. The 2-color version is worked in a silk/linen blend and the single color version is a wool blend. Finished Sizes: 68 inches (172.7cm) across the wingspan, 30 inches (76.2 cm) from neck to bottom point. Gauge: 18 sts & 36 rows = 4 inches (10cm) in garter stitch after blocking, 2 repeats, plus 1 dc of Edging pattern in 4 inches (10cm) after blocking. Needles & Hooks: 3.75mm (US 5) 24- to 34-inch circular needle for flat knitting. 4mm (US G/6) crochet hook or size needed to obtain gauge. Knit Stitches Used: knit, kfb, kfbf, sl. Crochet Stitches Used: sc, dc, ch, ch sp, sl, 2dctog, picot. 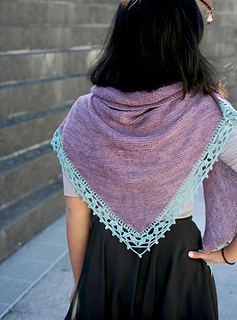 To adjust the size of the shawl, add or subtract repeats of the Pattern Row in increments of 12 (e.g. 242 times instead of 254. 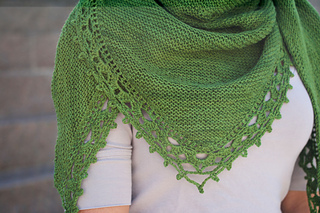 Each repeat of 12 rows will remove one repeat of the border on each side of the shawl. Yardages for body and border will both change.